Good Conversation in Great company. What a week, the Fizz, poetry workshops and a trip on a boat. There was a mix of abilities amongst the children, with some having the confidence to ask questions of the archaeologists as well as the facilitators. Every child produced at least one poem using a variety of poetic structures from Acrostics, Haiku’s to rhyming and free verse poems. 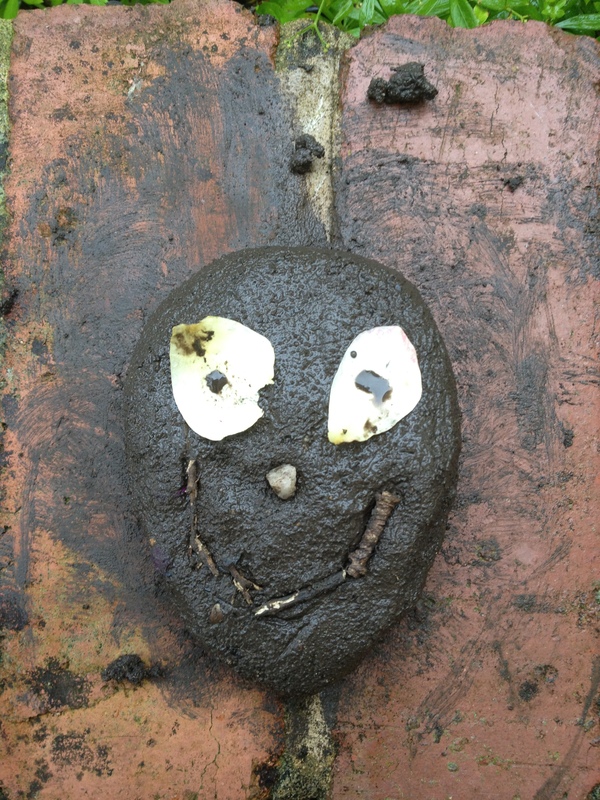 The dig and the artefacts inspired most of the themes for the poetry, but the children also brought imagery and smells in the sensory garden as a way of putting the dig into context of the modern day abbey. I created magpie poems, (magpie poem was a term to children came up with, as the lines were taken from their work and reused.) I took a line or phrase from each of the children in the group to create another poem. This exercise proved a great driver for the children who want to see their best lines included in the magpie poem. There was a lot of noise and great amount of fun. 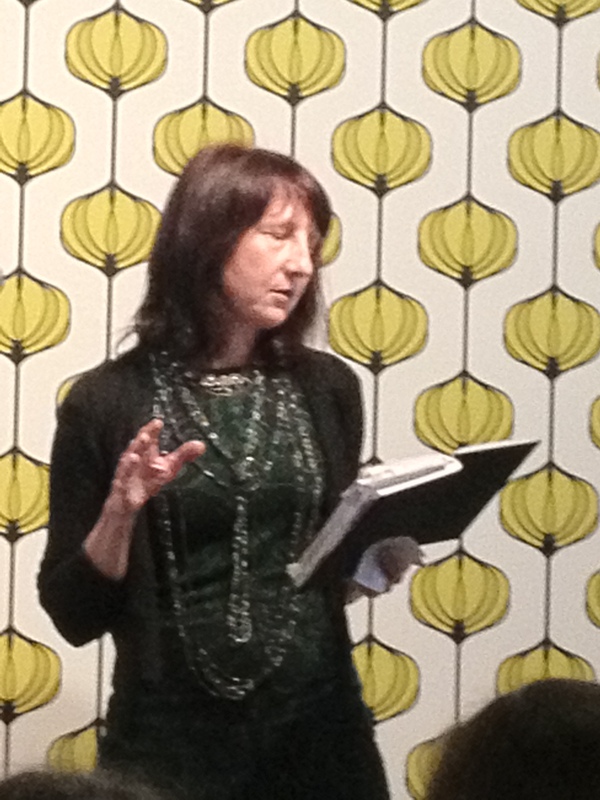 Tuesday Evening saw THE FIZZ with guest poet Terri Jolland, which saw the refectory filled to capacity with fourteen readers for one of the best Fizz evenings ever. Terri Jolland holds the audience. 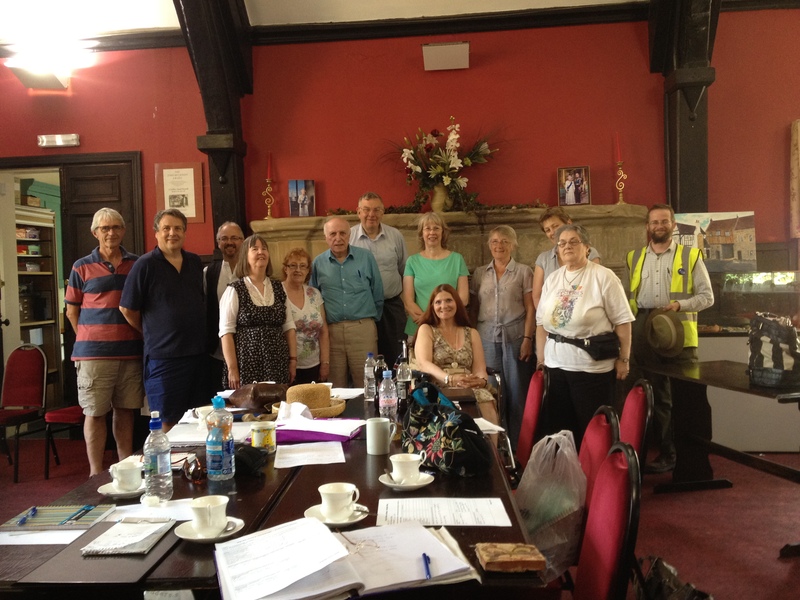 Last Friday saw ten poets gather at Polesworth Abbey for David Calcutt’s workshop – Spirit of the voice. The workshop looked at the way voices speak to us from the past- voices of people, places and objects – and what it is they may have to tell us about the present. Looking at: voices from our own past, voices from the Abbey’s past, its legends and characters, its written texts, its unearthed objects. In writing, the aim was to listen to these voices; let them speak through our words; let our words speak to them; let their words and our combined speak to the present and the future. The workshop saw the development of some very promising poems which the poets are sending to me to form the legacy of Dig the Poetry and new poems being created in Polesworth. Saturday and the sun was shining, I headed to the Canal to meet Jo Bell and Gary Longden. Jo is on an epic journey taking her boat from Macclesfield to Wiltshire, Gary and I had volunteered to be Jo’s crew for the day. 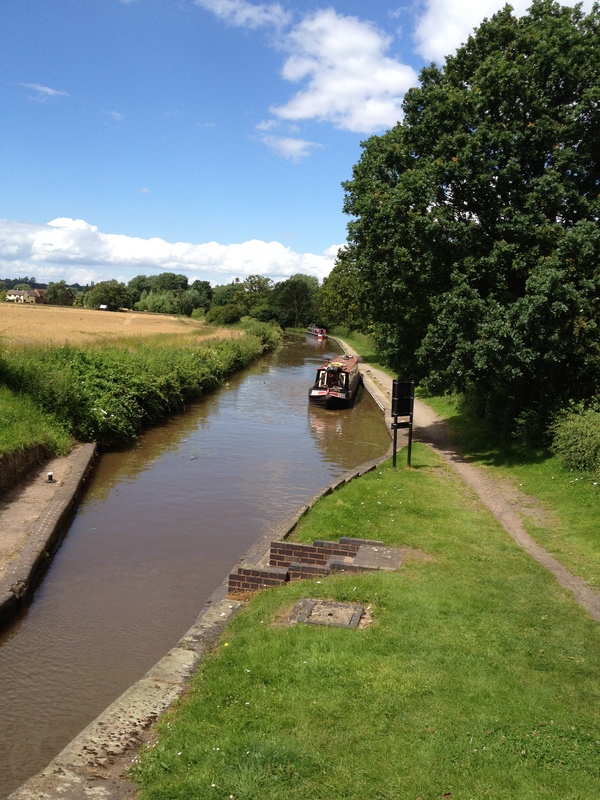 We met Jo at Polesworth and travelled with her through Atherstone to her overnight stop at Hartshill. I did tie up the front of the boat, didn’t I? 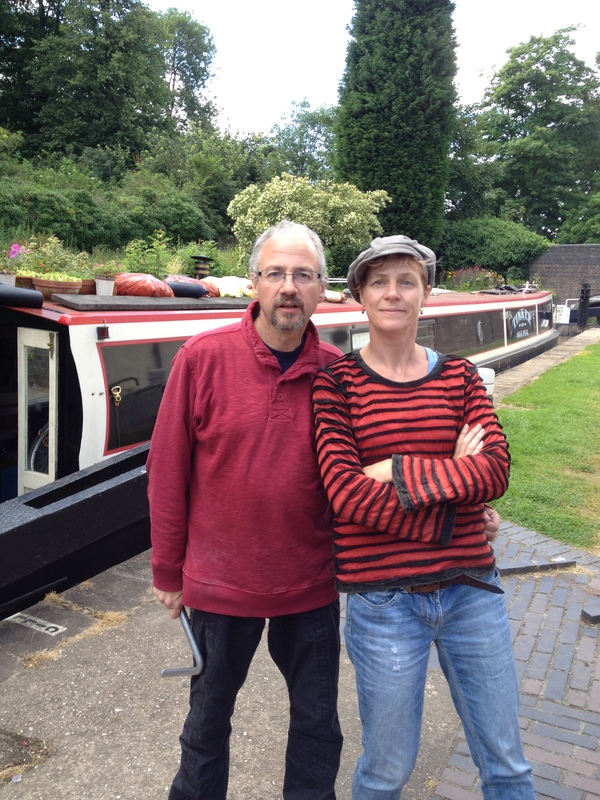 Our job was to open and close the eleven locks at Atherstone, whilst Jo steered the boat with great expertise. I learnt about how locks work and to my great pain which I can still feel now, as I tried to open a lock a little too early and it whipped back to belt my coccyx, a common occurrence among boaters known as boaters bum. In between locks we talked, three writers sharing ideas and we even bumped into a 4th writer on the tow path. It was the most brilliant, inspiring day that happens rarely and should in my opinion is something that writers should do more often. As I said on facebook “who would NOT want to live at 3mph” – it is a wonderful speed that gives you time to contemplate, talk properly and it was pleasure for me to do this in such wonderful company. Jo will be back in Polesworth on 1st September for her workshop on Dig the Poetry. Sat 4th Aug – THE ARCHAEOLOGY OF POETRY with MAL DEWHIRST. FROM THE EARTH CAME THE POET. 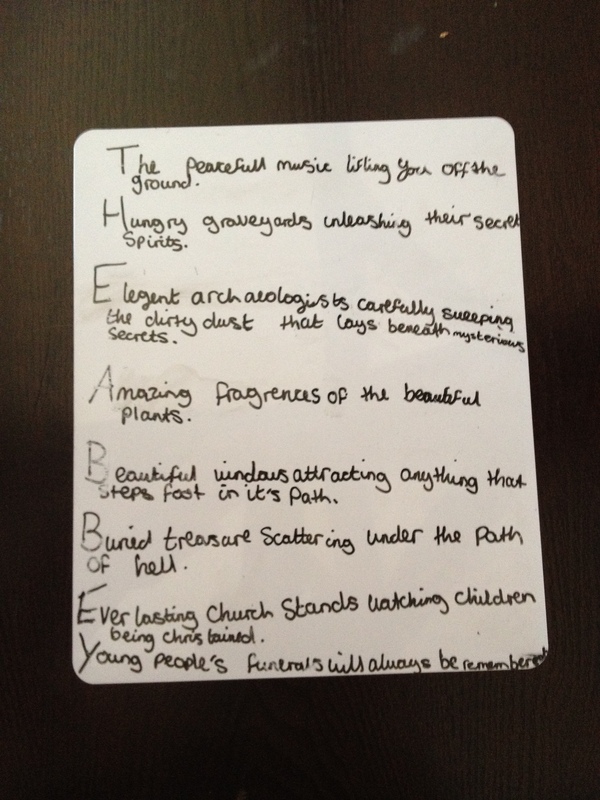 Last week saw the first of the Dig the Poetry workshops with the Polesworth School. Students from the school braved the rain to explore bones and soil with the renowned storyteller and novelist Cat Weatherill. Cat used the theme of man coming from the soil and then going back into the earth as her main theme. She used as story from Estonia, but many cultures have the same story just told in a slightly different way. 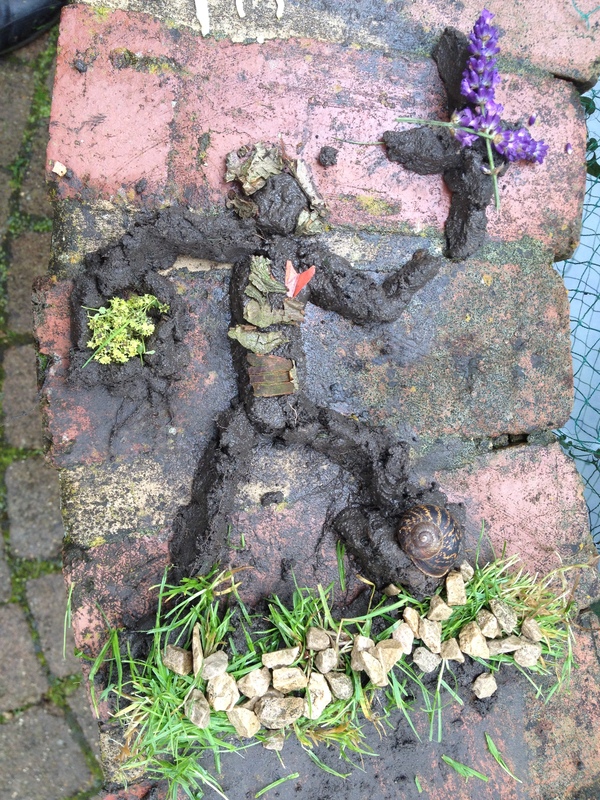 The Students got to create sculptures in mud, whilst observing the strict rules of silence as experienced by the Benedictine Nuns who once lived at Polesworth. Reflecting on the Nun’s lives in Medeaval times as the archaeologists uncovered the remains of the cloister walls and floors. Tim Upson-Smith, the community archaeologist provided us with examples of animal bones from last years dig, which the students studied in great detail. Identifying burn and knife marks that showed how these we the remains of 500 year old meals. The students went away with a buzz of ideas that they worked on during the final days of the school term and I look forward to reading the poems that they produced. The first of the Adult workshops is this Friday with poet, playwright and author David Calcutt. As full list of the workshops is given below. There are also four taster sessions for year 6 pupils this week, where we will spend a couple of hours exploring the use of the senses at the dig. DIG THE POETRY – A WORLD OF WORDS. Last Summer as part of my residency at Nuneaton Summer Day of Poetry, I requested that people from around the world send me words which I then crafted into a poem – see http://nuneatonpoetryday.wordpress.com/the-word-list/ and http://nuneatonpoetryday.wordpress.com/2011/07/03/collaborative-poem-2/ for the poem. I thought I would do this again this time with Dig the Abbey. Whilst you might not be able to attend the workshops or one of the daily site visits at Polesworth, I hope this will provide an insight into the activities at the dig and at least enable you to contribute something to the poetry programme. If you also let me know the town you are contacting me from, I will calculate the distance that the word(s) have travelled to reach Polesworth using http://www.mapcrow.info. You have plenty of time as I will close this at midnight on 31st August to give me time to write the poem, which I will read at the Fizz on the Heritage Open Day of 8th September. Hopefully if you are ever in North Warwickshire you will take some time to visit this very special place in the knowledge that you provided some of the inspiration to the new poems being created here. Dig the Poetry has its own blog at http://digthepoetry.wordpress.com. Please do pass this on to your fellow poets and those with an interest in Archaeology and lets see if the words reflect a different perspective to those writing poems on site. 3. Sat 4th Aug – with MAL DEWHIRST. The closing date for entries for the first Staffordshire Poet Laureate has been and gone. I made my entry two days before the deadline and I am now waiting to hear if I am to be considered for the short list. Those of you who read this blog regularly will know that it was here that I first raised the debate among the poetry community as to whether they felt it was something that was worthwhile pursuing. The response was a resounding YES. Staffordshire County Council picked up on these feelings and instigated the role to be installed for National Poetry Day in October. It is a great opportunity to help develop poets and poetry in Staffordshire and I look forward to supporting who ever gets the role this autumn and to some interesting developments in poetry in Staffordshire. 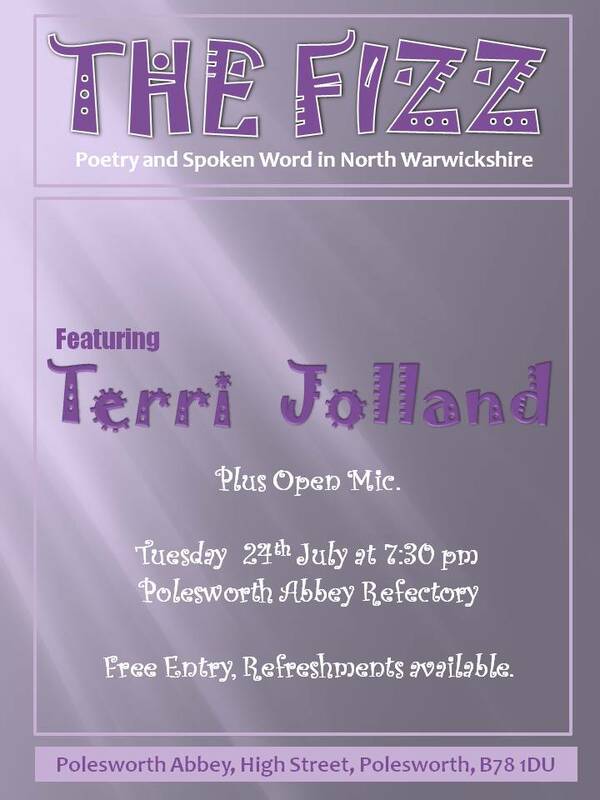 24th July – The FIZZ with Terri Jolland at Polesworth Abbey. THE SPARK IS VERY MUCH ALIGHT. I was hoping to get my review of The Lichfield Festival Fringe event Poetry Alight at the Spark Café last Tuesday posted on the blog earlier, but time caught up with me, with the Dig the Poetry workshops to promote and a workshop on Saturday afternoon at Coventry Memorial Park followed by the second film shoot of Double Booked on Saturday night. Oh and I fitted in the Bellowhead gig at Lichfield Cathedral on Wednesday and my submission for the Staffordshire Poet Laureate which closed on 14th July. Still better late and considered and I have not had time to work on my lost poet, which I will endeavour to do for next week. 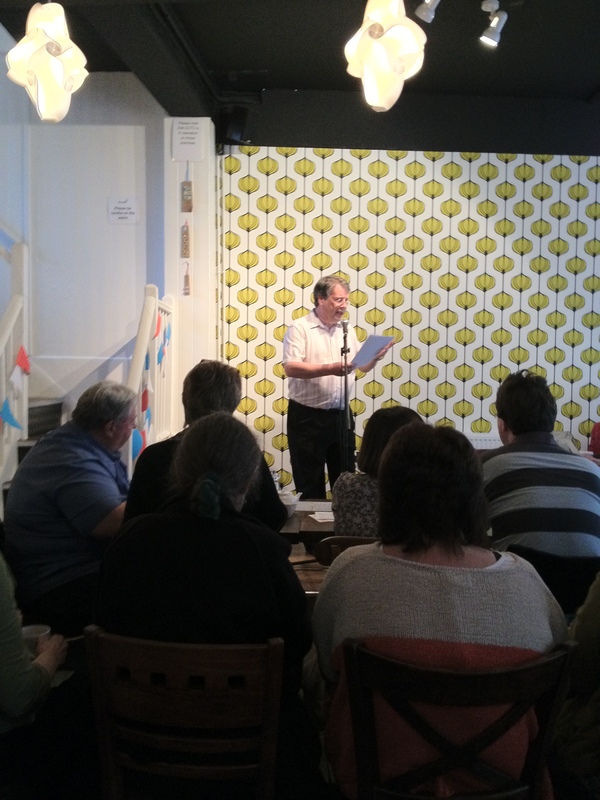 Poetry Alight at the Spark Café – Lichfield 10th July. I deliberately did not ask for a reading spot at this event as I wanted to make some space for someone whose voice I had not heard before. 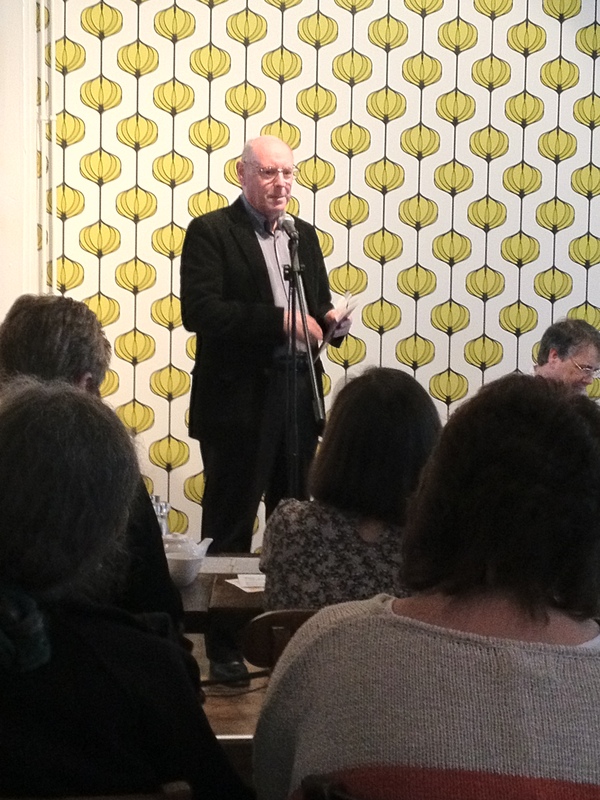 Gary Longden, whose wide travels in providing us with his fantastic reviews of the Midlands Poetry and Spoken Word events, brings him into contact with many great poets, who he brings to the Poetry Alight event to share their work with a full audience at this now established event. This month saw the guests from two poetry presses who are both actively delivering excellence in new poetry to new audiences, with Crystal Clear Creators and Offa’s Press. Gary in his role of MC started the proceedings in his usual way as a natural raconteur with the first poet of the evening Bert Flitcroft. Bert began with saying that he always felt his name Bert was unpoetic, until he was presented with a Chinese print with his name spelt out in Mandarin script which changed his mind. His next piece was the observation of a man stumbling, with the excellent poem What I Know, which ended with a silence in which he left us to reflect. Bert always performs his work well and can hold the audience; this was a very fitting start to the evening. Next came the first of the Lichfield poets, with a double act from Val Thompson and Heather Fowler, who delighted us with their thoughts on the state of the NHS which Lazarus Team, followed by a poem to Yoga with saluting the sun. Being a double act meant that they had twice the normal three minutes so they continued wit More Than which remembered a teacher Miss Hughes and continued with The Tray and the pains of sick dog. They finished with When the Talking is done. There approach to delivering poetry as two voices added another dimension. More poets should consider this, creating narrative from the poems. They were followed by the first of the representatives of this year’s Coventry Cork Literature exchange which I had the honour of being part of last year. Jayne Stanton, Jayne who is based in Leicestershire gave us two poems, the first reflecting on the Garden of Remembrance at Loughborough University with fear of leaving memories; she followed this with Heat with legs dropping, melding and daring to dream. 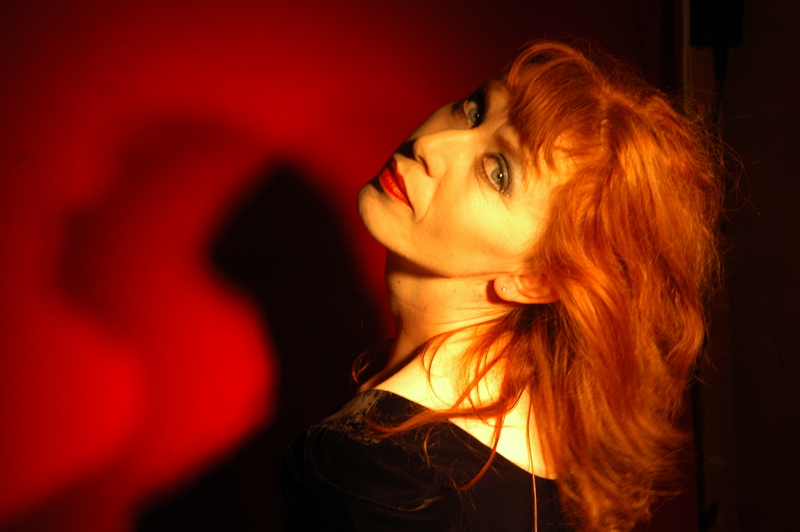 She will really enjoy her trip to Cork in August and O’Bheal is in for a treat of great poetry. Next came a new voice to me and what a wonderful one, with Naomi Paul whose rhythmic poem proclaimed that Music is Female, with the truth about the goodness of rhythm. A wonderful piece that resonated around the gathered company. She followed this with a poem on the Icelandic Ash Cloud, blaming Bankers and Politicians. Her final piece Grey Rabbit told of a bus journey in the USA on the Hippy Bus which was basically converted into a bed where she mixed with women who had lovers and hung out on Haight Ashbury and how she was very English. A great set. Next came another new voice, who had travelled down from Cheshire, the well published Peter Branson whose next collection is to be published by the much acclaimed Salmon press. Peter remembered the Queens coronation with Jubilee which was dedicated to Brian Lithgow, a friend who had hidden in ditch behind the shed during the original coronation, which had made him a Republican. He finished with a song the Editha Massacre which was a tribute to the great American folk singer, Woody Guthrie who was born 100 years ago this week. Justina Hart came next with a poem about lovers, Nightingale which is never heard piercing the light and imagines a star passing down her throat. Another new voice to me and a very good one too. Ian Ward another of the Lichfield Poets, reordered the words of D H Lawrence with his poem Kangaroo which he followed with a poem after Walter De La Mare’s The Listeners with a response to the traveller another accomplished reading. 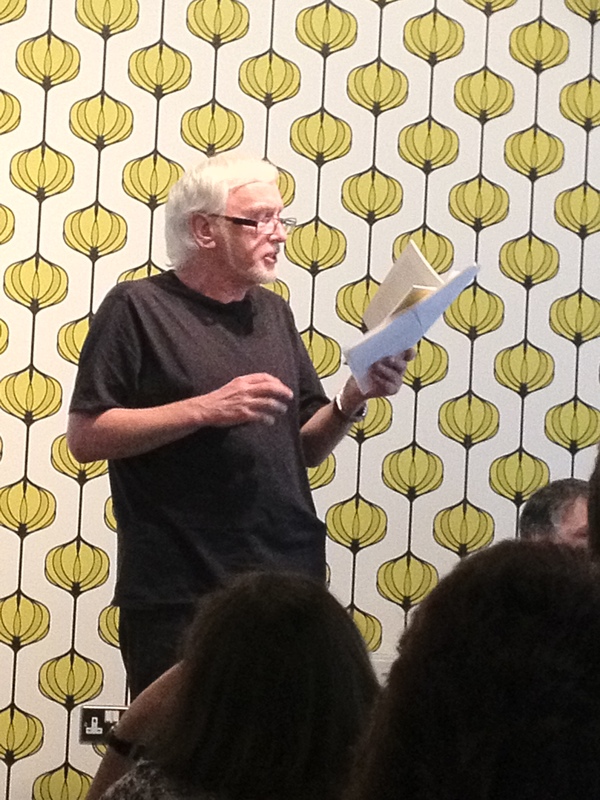 Nottingham Poet Richard Young delivered one of his delightful funny poems from memory, a performance that has become accomplished since I first met Richard. His humorous poem saw him feeling sorry for those unfortunate heroes such as Michael Collins – the 3rd man who did not land on the moon on Apollo 11, to Frank Bruno who didn’t rumble in the jungle, Gareth Southgate who missed that penalty but despite all of this they Keep Trying. Strong material and a strong performance, I can listen and watch Richard at anytime. 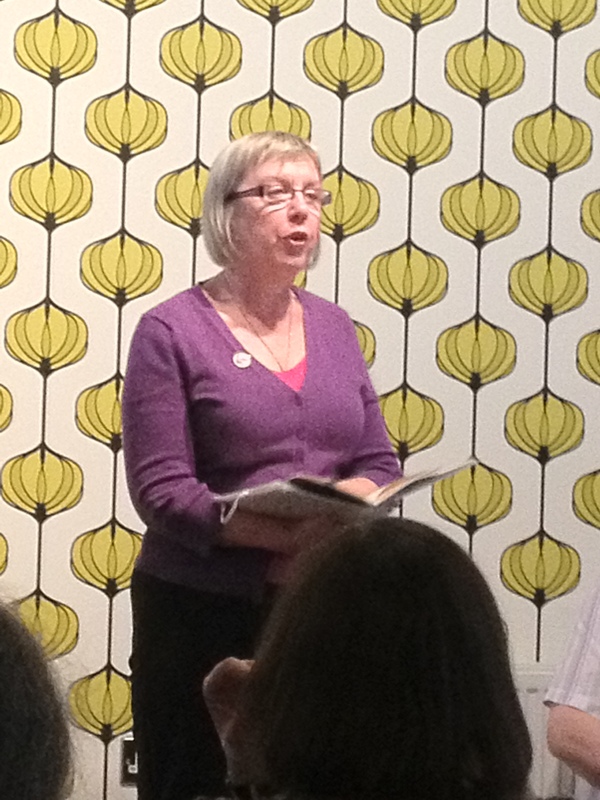 Poetry Trail Poet, Penny Harper found objects that never fulfil their potential, like a second hand hoover, she followed this with a wonderful poem about the island of Skomer in Pembrokeshire, ancient, British stitching Island to the sea in flight. 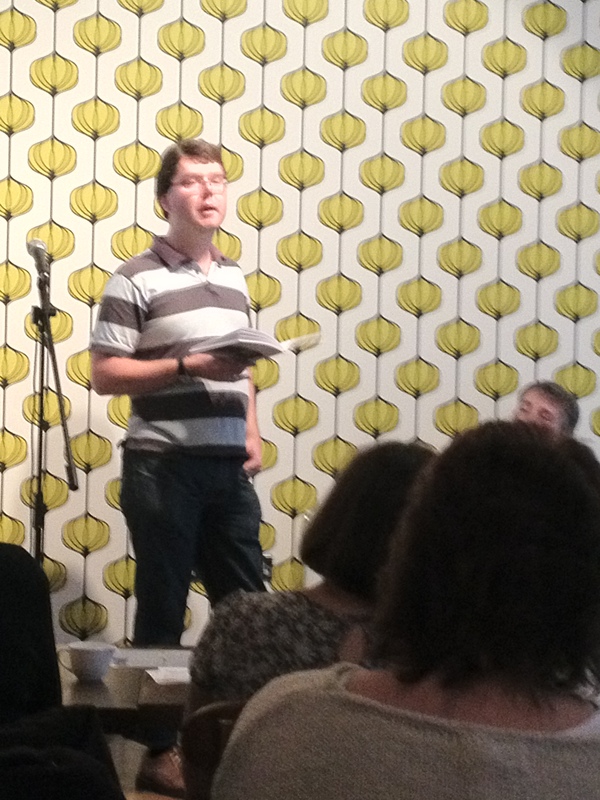 The first half was finished by the first of the guest poets with Crystal Clear Creative’s Jonathan Taylor. Crystal Clear Creators have been organising day schools, radio performances, poetry events and publishing pamphlets and the magazine Hearing Voices since 2003. 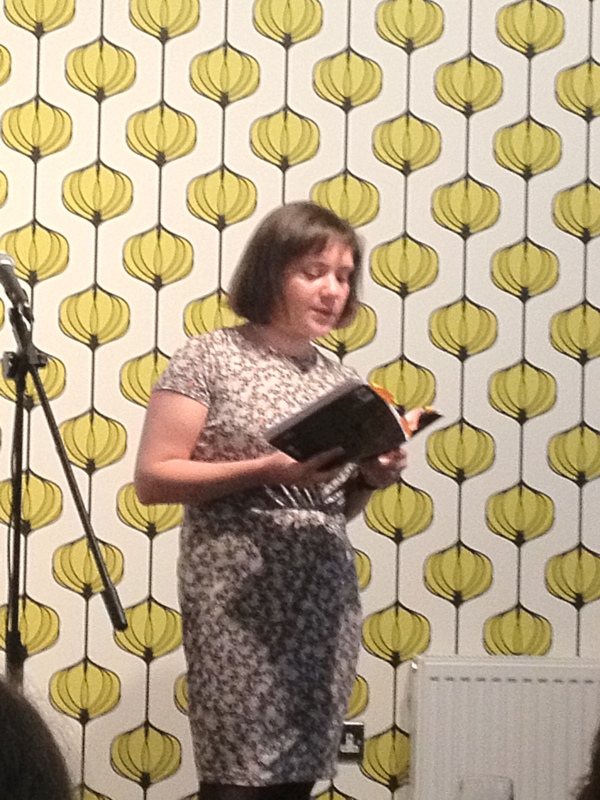 Based in Leicester they host the Shindig poetry events. Jonathan started with a poem, Mozart’s Clarinet Sextet with its counterpoint of gin and wee as a concert is interrupted by the musings of a drunken woman, well written and delivered from an accomplished pen. He followed this by one of the pieces of the evening Kontakte – a prose piece after Karl Heinz Stockhausen, which was a story built around the electronic minimalism of the music. The protagonist was Derick who sat in the dark listening to Stockhausen on a tape recorder, which perpetually rewound and replayed. When he tried to turn it off the stop button broke and we are left with the image of Derick sitting in the dark spending the rest of his life listening to Stockhausen. This was a triumph and I can well see why Jonathan would want to divert us away from poetry to explore the brilliance of this piece. 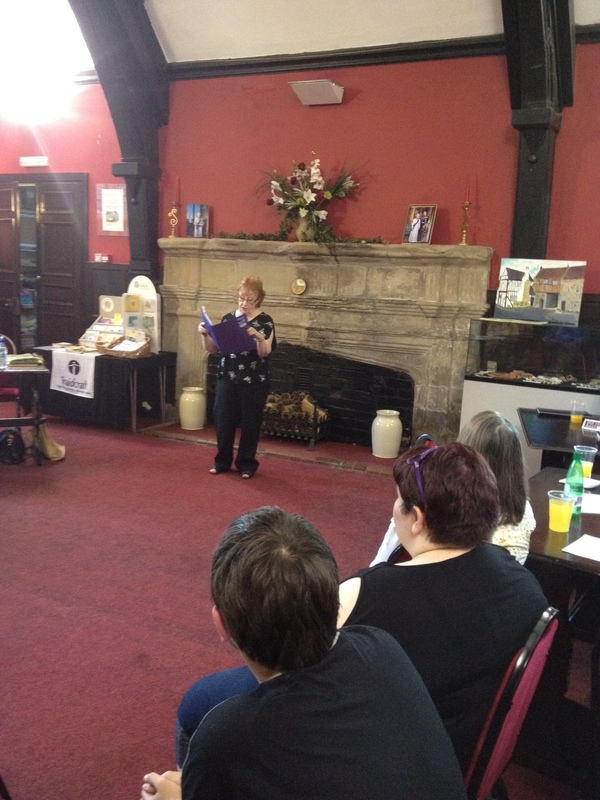 The second half was headed by our two guest poets from Offa’s Press, Jane Seabourne and Nick Pearson. Offa’s press are dedicated to publishing and promoting the best in contemporary poetry from the West Midlands, with the watch word good on the page, good on the stage. Jane read from her collection Bright Morning, her first poem Red Kites, where she had expected them to be redder than they actually were, but was transfixed by their flight to come to the conclusion that they we red enough. Her second poem Ornithoptor, talked of a man in an office learning to fly, observing the birds and building his wings and then escaping the drudge of his job to fly, something that resonates with me. Her third piece was to her hero, Dr Johnson who she described as a fleshquake of a man who kept his words safe in his book. She showed her respect for this literary hero in her well crafted poem. Jane finished with her Three Bears Poem, which explored the impact that an intruder can have on the lives of those who the intruded. A good place to finish with a thought provoking piece. 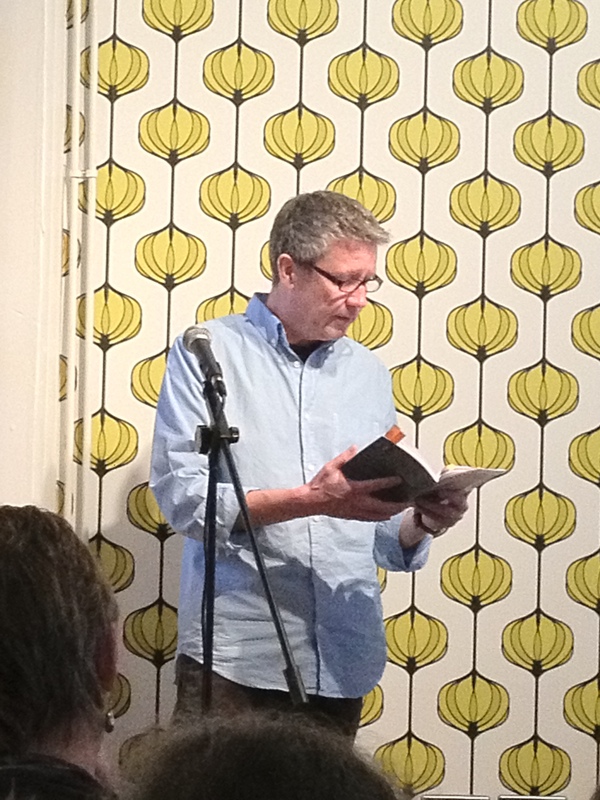 Nick Pearson was the second guest from Offa’s Press, reading from his collection Mad in Captivity also available for the Offa’s press website. He delves into familiar worlds with known characters that sometimes are ourselves. His first poem Clothing Item covered a man’s obsession with a pair of M&S Chinos, he followed this with the very witty and recognisable Coming Clean, which brought the theme of an employee appraisal, again a familiar situation to many and I guess like me he saw the pointlessness of them. Nick continued with Silent Apple, among the noise of office lunchboxes, the silent apple has more dignity in the hands of someone who reads books; it contemplates its life on the tree, ripened by the sun and the stars. His poem Receivership, an observation on the plight of independent traders in the world of the corporate giants, in his case a coffee shop who went into administration before he could redeem his loyalty reward card. Referential upbringing took him back to his childhood and the confusion of words, playfully expanding meanings and connections that only a child can do. He finished with a poem about giving up smoking, Final Frame, where observations and conversations become focussed on smoke, ash and nicotine. These are all written from Nick’s unique perspective but are without doubt so familiar to some many people. A great reading from an excellent collection, both Jane’s and Nick’s collections are excellent reads, do check them out. The evening continued with a reading from the second of the poets on the Coventry-Cork Literature exchange, who is also a Poetry Trail Poet. Janet Smith read A Cry her poem from the trail, a poem I will never tire of hearing her read. She holds the audience within the spell of the conversation between the human and the bird. She followed this with the Hood Children a poem about rain and finished with Brushwood drawn from her Yorkshire roots and the textile industry. Another excellent set which will see excellent readings in Cork and Limerick this summer from two very accomplished voices. Another of the Lichfield Poets, George Barbrook gave us a musical theme with Rhythm and Blues followed by Open Access which explored dementia. 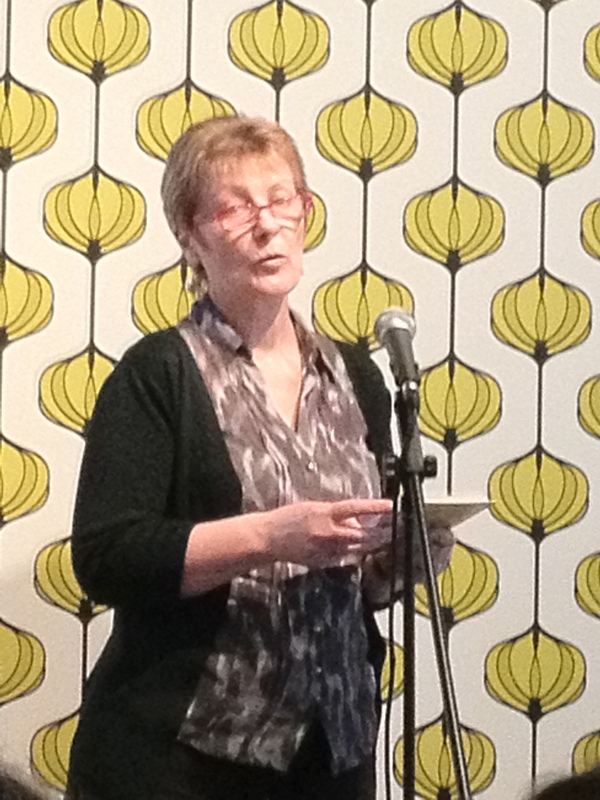 Followed by Penny Hewlett who gave us a poem of broken lives with going back all too great effect. A new voice with Jemma Hogg who read three poems written at the Glastonbury with Pedestal Lover, The Fraud and the Darkness, she was followed by Mike Seaton from Northern Ireland whose poems on going home and the return of the snow were also a great introduction to their poems at this event. Ben McNair gave his poem of student bands with Hallelujah Jones and his observations on Manchester streets at 2:00am with its Picasso spewing bouncers. Burton based Poetry activist Gary Carr followed Ben with his I can’t get no information, with his takes on tweeting and social media, a piece he started as he walked through the audience to great effect. His second poem Red and Black explored the serious world of table tennis. 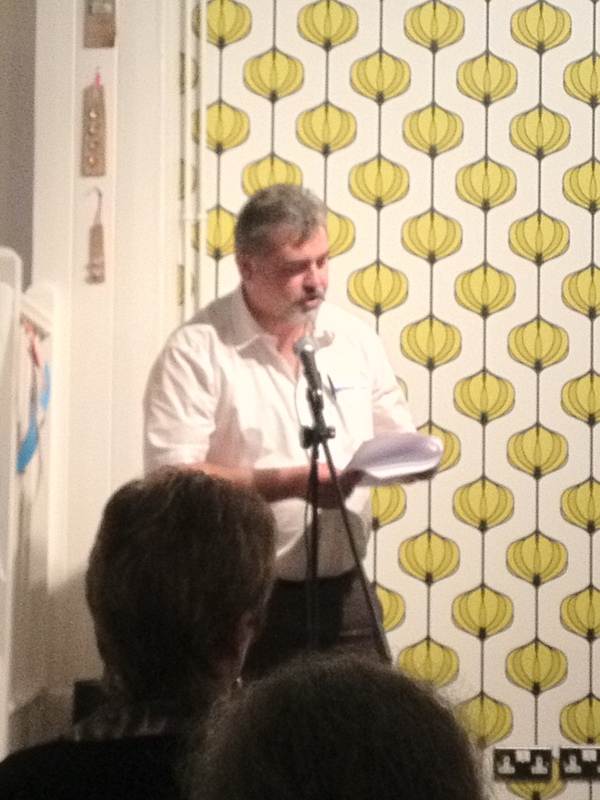 Gary finished with a favourite of mine, two poems which took poetry readings both good and bad as its theme. Gary always delivers and his explorations into new ways to engage an audience are always of interest, they worked well here. Gary runs Spoken Worlds at the Old Cottage Tavern, Bykerley St Burton on Friday 20th July at 7:30pm. Another new voice to me with Shawn Rolls, whose poem reflected on the frailty of the old as they become victims of conmen. Tom Wyre brought some of his new poems The Lucid Door, The Strength of Spirits, finishing with an environmental Mother Earth poem Terra Mater which were all full of imagery that is Tom’s forte. Gary Longden our host gave us a poem on his disgust at bands reforming in a frenzy of retromania. The evening was finished with two poems from the leader of the Lichfield Poets, Janet Jenkins, who mused on Tennis and her own love match with Forty Love and ending with a comic tale of the teeth. The evening was again a wonderful evening of the best contemporary poetry from the region and beyond it will be interesting to see how this event develops along side the Literature Festival, which seems to pander to big names and is surely missing a trick by not including an event such as Poetry Alight as part of the festival programme. The next Poetry Alight will be on 2nd October at the Spark Café, 7:30pm, Free Entry but you need to contact Gary Longden in advance if you want to read. In addition to this Cat Weathrill will be running a workshop with students from the Polesworth School on the 18th July. I will return to my lost poets next week and I think I will re-start with Leander Paes Great Grandfather. THE POET WITH A RACKET. 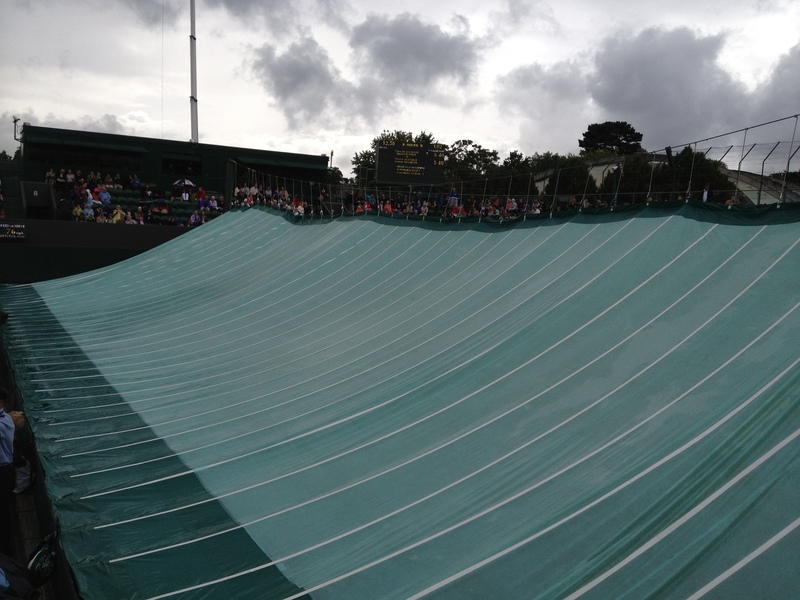 Last year it was lunch at the Ritz that was the event that I thought I would never do, this year it was Wimbledon. Wimbledon, the Championships that kept our interest alive to the very end, where British hopes were raised as we held our breaths on Sunday afternoon. 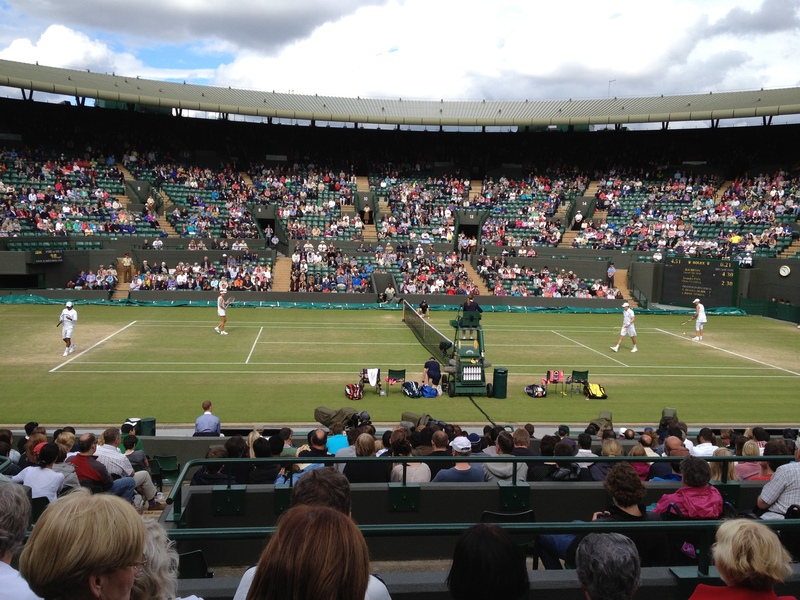 Our day at Wimbledon was on Saturday, tickets for number 1 court, the mixed doubles semi-finals being the main event. The trip was an organised weekend that saw us travel down to London on Friday for an afternoon in the sunshine as we road the London Eye. Sunshine, I hear you whisper, I have heard of it but never seen it. 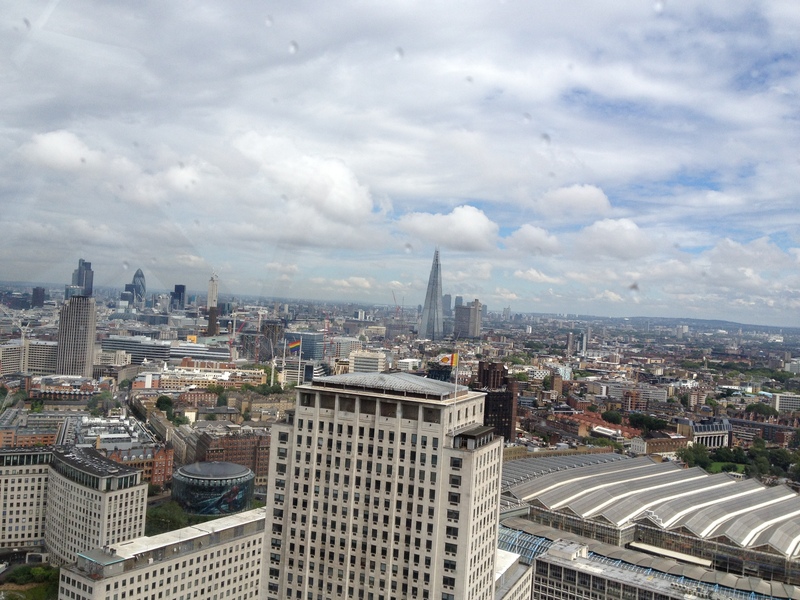 London looked magnificent from the capsule at the top of the wheel, Westminster, St Paul’s Cathedral, The Gherkin, Battersea Power station without the flying pigs. The latest piece of this busy landscape rises like an arrowhead and points to a space in the sky where the clouds bow. The Shard, its glass fragility hidden beneath its confident stance. We wended our way through the tube to Covent Garden, with its street theatre and market stores, surrounded by designer brands that were not there last time I looked. A beer at a street bar, listening to the world of languages passing through. So Saturday arrived to bring the main event. We left our hotel in Croydon by coach and headed across to Wimbledon arriving just after 10am. The gates opened at 10:30, but that was no matter we were about six feet from Gate no 1 and would make the most of the day. We were queuing because that is what we do in England. As the gates opened we entered and made our way to Murray Mound where the large screen displayed to days events. Our matches on Court No 1 were not until the afternoon, so when we saw that on court no 3 at 11:30 there was an invitation match with McEnroe and Nystrom vs Bahrami and LeConte then this was the place to go. All seating was unreserved and we took over the front row of the Press seating and waited for the match to begin. 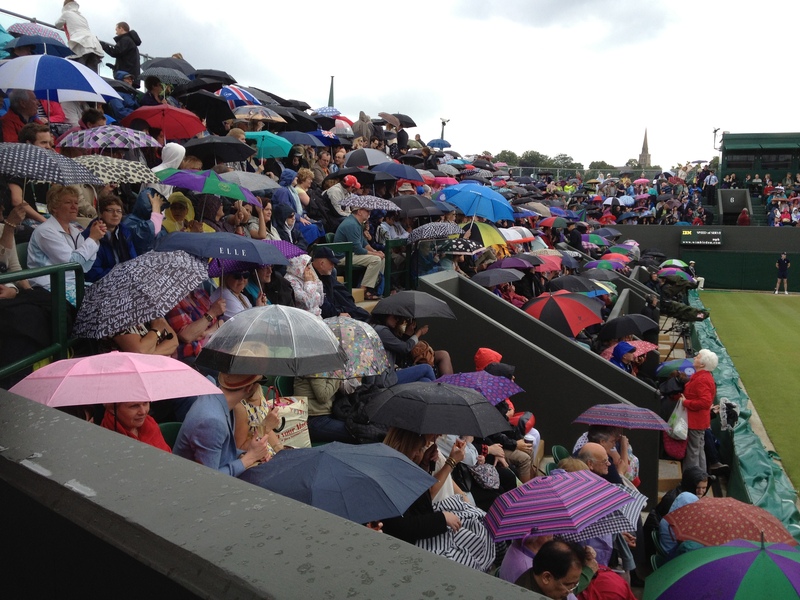 Surrounded by ladies with Welshcakes and Champagne, young couples and elderly ladies who were old hands at Wimbledon. The first thing that struck me was the regiment of the proceedings. Everyone had there position, their uniform defined their role; everyone knew what was expected of them. No one would be asked to do anything that was not defined as part of their duties. Boys and Girls in dark blue were ball boys and girls; they did not put up the net or manage the covers that was the ground staff dressed in dark green. Umpires and line judges wore smart purple blazers. It all felt right that there was order here, that tradition and ceremony was delivered as a delight. Then the rain came, first a passing shower and brollies covered the stands as if an installation had been created, hiding faces but not the spirit of the participants whose calls and laughter, said this is OK, we can handle this. The shower passed and an army of green, swept on to the court, raising the net, bringing on chairs, laying out those familiar towels. Then the blue clad youngsters marched in through set routes, choreographed to perfection. They opened the tubes of balls and rolled them with precision to the service ends. The Umpire arrived in his pale trousers and purple blazer with its cream piping. He inspected the court and measured the net, adjusted his seat at the top of the ladder and only when he was satisfied could our players enter. McEnroe the tall American, it was Patrick and not John, alongside Joakim Nystrom the quiet Swede. Then the whirlwind that is Mansour Bahrami, the court jester whose tricks and jokes thrilled but hid the trauma of his upbringing in Persia, where he could be a ball boy but not a player. When he was caught playing his racket was smashed and so he had to learn his craft with a frying pan. 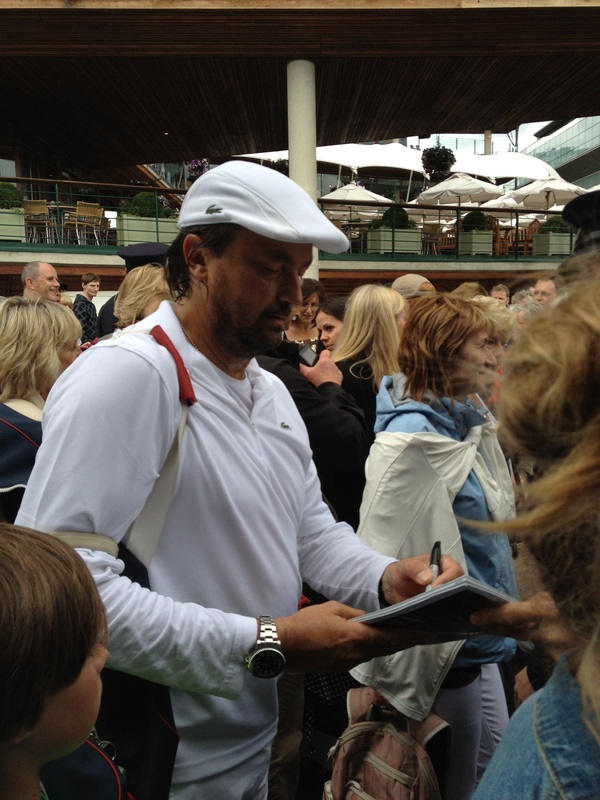 His partner the famous joker Henri LeConte whose impersonations of players both passed and present created enthralled laughter. 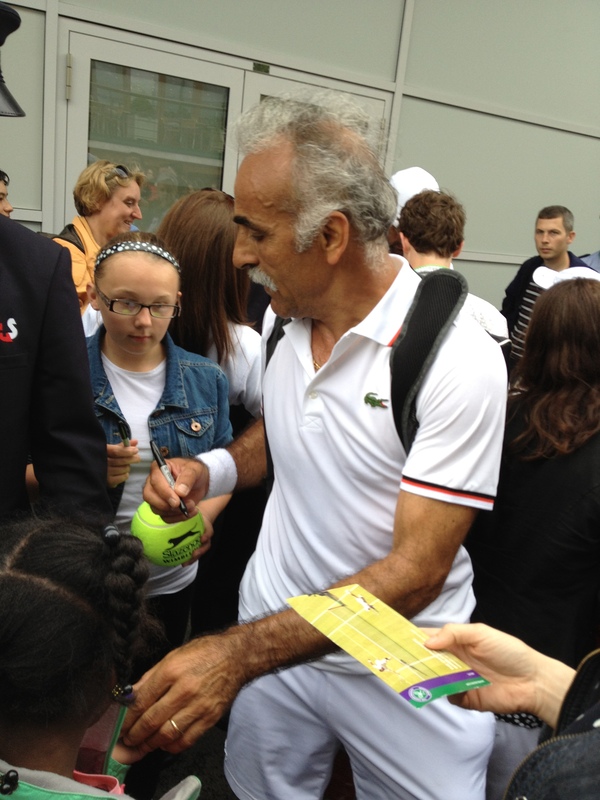 Bahrami was by far the star of the game. He really is a truly great player, even at the age of 56 he has a sharp eye and movement that saw his opponents fooled into think he had missed the short only to hit it with a swift turn of the racket. We saw him hit a ball thirty feet into the air and then catch it in his trouser pocket. Hit shots whilst talking to the audience or through is legs with such power and speed. He was boundless with his jokes, impersonating Patrick McEnroe’s more famous brother, selling bottled water to the crowd and at one point taking on all three of the players. This was not a serious game; it was showmanship at its very best. The game was interrupted by a heavy shower, the Umpire suspended play and the covers were drawn across. This was theatre in its own right. We have all seen the ground staff grab the hoops and run across dragging the cover into place, but I for one had never seen them drag it back and put it away. The storm was heavy as the clouds heaved themselves over the court, our brollies raised we settled in until it passed we were not going to miss the rest of this game. As the shower passed the ground staff lifted a rope to the centre of the court and attached it to the sheet and hooked it over pulleys at either end of the court. They then raised the columns that held the pulleys so that the cover lift in the middle to create a ridged tent as the water ran down to the sides and drained away. The cover was lowered and folded away as the sun broke through and the game recommenced, Bahrami/LeConte took first set, McEnroe/Nystom the second, the game was decided on a tie break which McEnroe/Nystom won. But it was Bahrami/LeConte who delighted and brought so much laughter. 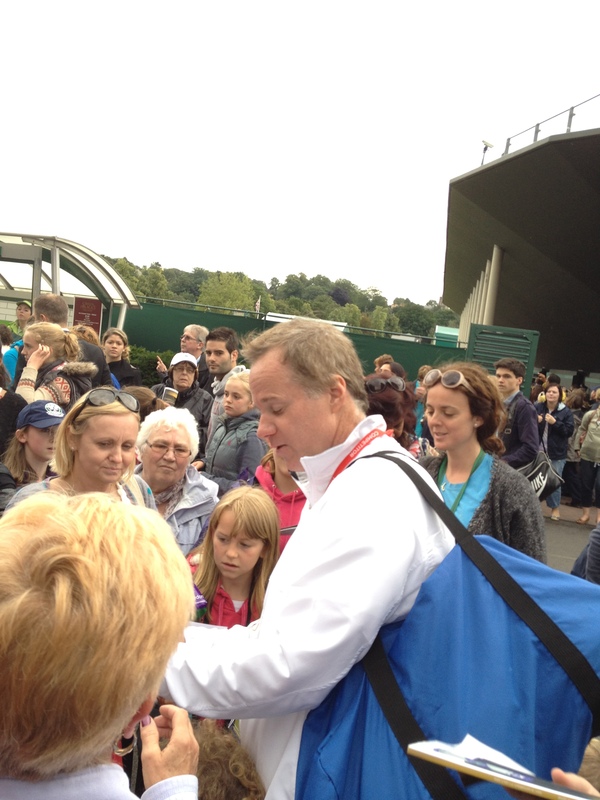 It was time to head to Court No 1, for the first of the mixed doubles. This had all the tradition and ceremony but with the seriousness of the challenge. Mike Bryan and Lisa Raymond executed the game with short shrift to beat Zimomjic and Srebotnik in two straight sets. This was followed by Mike’s brother Bob Bryan and Liezel Huber being beaten by Leander Paes and Elana Vesnina over three sets. This was determined tennis where in both matches the most clinical of finishing won the day. Taking the chances as they came and not releasing hold of the game once you had the upper hand. The Mixed Doubles final which followed the Mens Singles final proved to be a thriller when it was played out on Sunday evening and in some ways it meant so much more to me as I had witnessed the semi-finals first hand, I some how had a part in the outcome. Something you can only get from being there, creating the atmosphere rather than watching it in the isolation of your front room. If you get the chance to go to Wimbledon, or if not create the chance yourself, it is a wonderful experience one I shall pursue next year. 20th July – Spoken Worlds at the Old Cottage Tavern, Burton On Trent. Talking of unique opportunities, even once in a lifetime one’s, I saw the Olympic flame pass the end of my street yesterday as it continues its journey on route to London in about three weeks time. 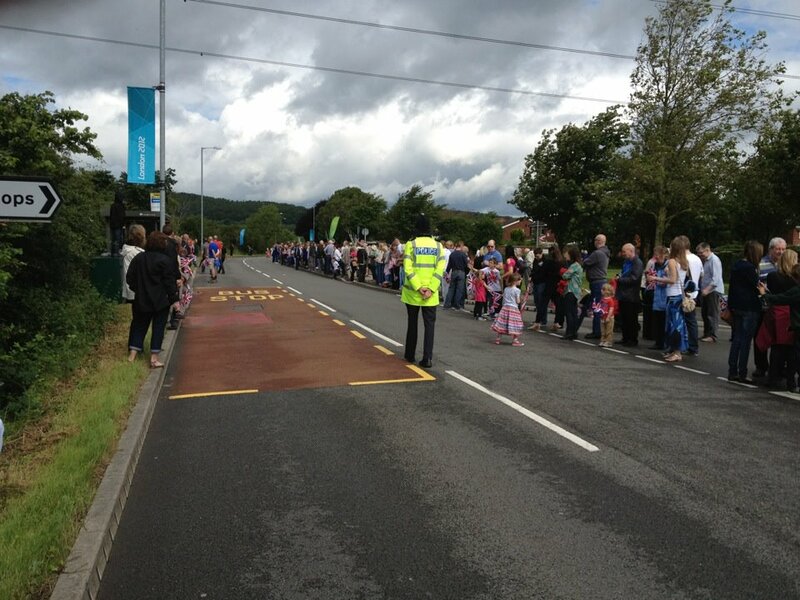 It entered Tamworth at just after 10am carried by the local Catholic Priest along the closed road that was lined with people, bedecked in Union Jacks, cheering as it past. It was preceded by the corporate sponsors which is the norm these days in their large trucks dishing out their wares to the gathered crowd, each with their own sound systems to whip up the crowd to cheer the forthcoming event of the sacred flames passage through Britain. Having said that the truck with the Bank sponsor was fairly quiet, perhaps under our austere circumstances it was probably for the best, the event itself took our minds off our economic worries for a few moments and so it were did not need them to remind us of how these worries all started. This was followed by a wonderful afternoon in the grounds of Tamworth Castle watching the talent of all ages perform on the stage in an Olympic festival of song and dance. It was great to see so many members of the Wall cast showcasing their talents in other areas. I was particularly impressed by the Tamworth Youth Dance performance in the rain, Barry and Chloe Hunt did a great set, the drummers from St Gabriel’s school were excellent and Tamworth Voices stole the show. A great day, congratulations should go to all involved and especially to the Arts and Events team at Tamworth Borough Council, you did the town proud on Saturday, these are not just my words but the words of so many people as we headed home. 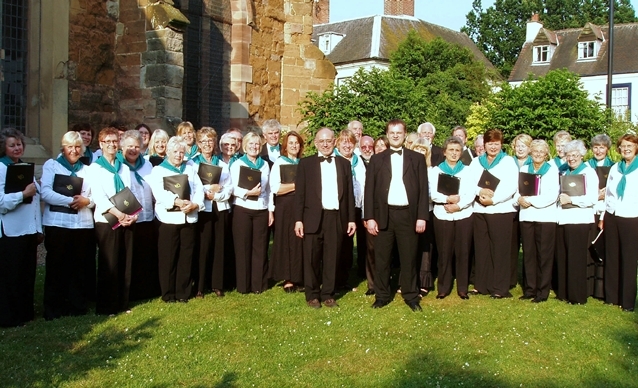 The evening saw a trip down to Polesworth to see Hinckley Choral Union with their Elizabethan Serenade, taking the poetry of 16th Century set to the music of the 20th Century bringing the two Elizabethan ages together. It was really well done and showed another way to bring poetry to new audiences. Rupert Herd read Michael Drayton’s Clear Anker as one of the few pieces that were delivered as readings rather than song, and very well he did it too as the words originally written at Polesworth Abbey were once again to echo around the eaves of church. I was also enthralled to hear the pieces of The Occasional Music Recorder Group, whose instruments ranged from bass to treble some looking like plumbing accessories rather than musical instruments, but what a wonderful sound they made. It made me realise that this is a much maligned instrument, partly because it is given to seven year olds who have a tendency to throttle it. Another great experience in my search for new ways to deliver poetry. RADIO WILDFIRE – ON THE LOOP. Congratulations to Dave and Vaughn at Radio Wildfire. – I receive this note from Dave. It’s the 50th edition of The Loop and there’s a brand new 2 hour mix of material now playing on Radio Wildfire – Now playing 24/7 a completely new selection of stories, satires, poetry, spoken word, music and interview @ http://www.radiowildfire.com – another two hours of live literature and chat. The Loop brings you interviews with poet in residence at Birmingham’s Symphony Hall Julie Boden about her new poetry and photography exhibition at Coventry’s Belgrade Theatre, 110 Metre Hurdles, and with storyteller Maria Whatton about her work in progress The Lunar Men. The Loop brings you a plays from Keith Large, with his look at domestic violence Fists and Chips, and from Douglas Mackin with a powerful tale of a cheating husband Signal To Noise. … and poetry with soundscape and music from Stephen Mead, Andrew Barnes and Mark Goodwin. The Loop brings you a review by Mal Dewhirst of Being Human the Midlands Creative Projects production of the anthology from Bloodaxe Books. The Loop brings you satire from Joe Grimwade who asks you to Blow Your Nose for Britain. The Loop brings you song from Carol Widenbar. AND there’s Gary Longden’s Listings – check it out you might just be featured! The Loop is curated by Vaughn Reeves and will play online continuously for the next month, except during our live broadcast on Monday 2nd July starting at 8.00pm UK time with a full programme of pre-recorded tracks, live studio guests and conversation.